Are you considering weight-loss surgery? There are three different types of bariatric surgery most commonly performed in the U.S.: laparoscopic adjustable gastric band, gastric sleeve and gastric bypass. Each procedure has pros and cons. 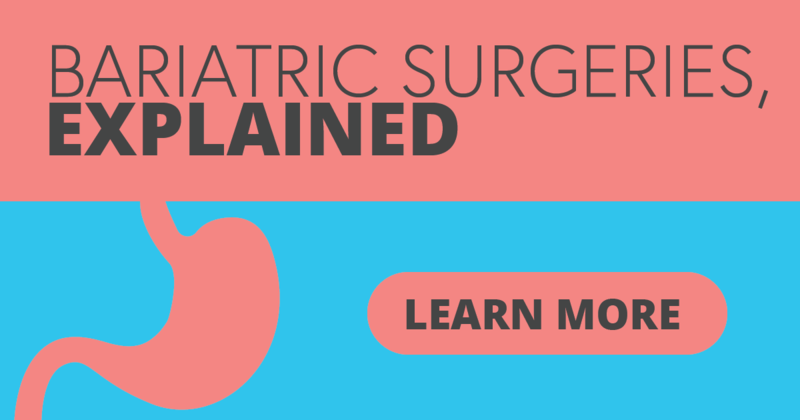 Learning about how each surgery works can help you make an informed decision. In this surgery, a ring lined with an inflatable band is placed around the top of your stomach, creating a small pouch. The band is filed with a salt solution and connected to a port placed under your skin. The size of the opening between the pouch and the rest of your stomach can be adjusted by adding or reducing solution through the port. How you lose weight: After surgery, you'll have follow-up visits where the band is adjusted. The band causes you to feel fuller faster when you eat. Thus, you eat less—and consume fewer calories. No cutting into your stomach. Shorter hospital stay than with gastric sleeve or gastric bypass. Is adjustable and reversible (the band can be removed). Has the lowest risk for vitamin and mineral deficiencies, which can happen because your body may not absorb nutrients well after a procedure. Less weight loss than with other types of bariatric surgery. Requires a foreign device to remain in your body. Has the highest rate of re-operation among the three procedures. In this procedure, the surgeon removes most of your stomach, creating a long, banana-shaped pouch. How you lose weight: After surgery, you can only eat small amounts of food at a time, making you feel fuller faster. Gastric sleeve surgery also appears to affect gut bacteria and hormones so that you may feel less hungry. Greater weight loss than with gastric band. Doesn't require you to have a foreign device in your body. Short hospital stay (about two days). Doesn't involve making changes to the intestines. Higher risk of vitamin deficiencies than gastric band. Higher risk of surgery-related problems than gastric band. Also called Roux-en-Y gastric bypass, this procedure is considered the gold standard of weight-loss surgery. As with the gastric sleeve and gastric band procedures, the stomach is made smaller—in this case by stapling it to create a small pouch. In addition, this surgery also involves creating a bypass that routes food around most of the stomach and the upper part of your intestine. How you lose weight: Like the other two procedures, the small stomach pouch makes you feel full sooner. Because food bypasses part of the digestive system, you absorb fewer calories. The bypass also changes gut hormones and bacteria that appear to affect appetite and metabolism. Greater weight loss than gastric band. No foreign objects are placed in body. Difficult, but not impossible, to reverse. Higher chance of vitamin shortage than with the other two procedures. Higher chance of surgery-related problems than gastric band. May increase risk of alcohol use disorder because surgery may change the way your body absorbs and breaks down alcohol. Bariatric surgery isn't just about losing weight. It's about getting healthier. After surgery you may see improvement or even disappearance of conditions such as high blood pressure, high cholesterol and even type 2 diabetes. However, you need to make a commitment to permanent lifestyle changes. You should develop a plan to be more physically active. Your diet will change. You'll need to take a multivitamin—and possibly other supplements—for the rest of your life. You'll also need to undergo yearly lab checks. Bariatric surgery is great for some people, but it's not the right choice for everyone. Find out if surgery might be right for you .